The National Oregon/California Trail Center at Montpelier Idaho. Beginning at the town of Soda Springs, the 54 mile long Oregon Trail Bear Lake Scenic Byway runs along U.S. 30 all the way to the Utah Border. This scenic byway takes its travelers by the National Oregon-California Trail Center in Montpelier Idaho, Paris Tabernacle, Minnetonka Cave and Bear Lake State Park. Also at Soda Springs is a northward highway (State Highway 34) that takes you to the historic ghost town of Chesterfield along the Pioneer Historic Byway. This wonderful ghost town is located 25 miles north of Soda Springs and is very much worth the time and effort if you like Western ghost towns. 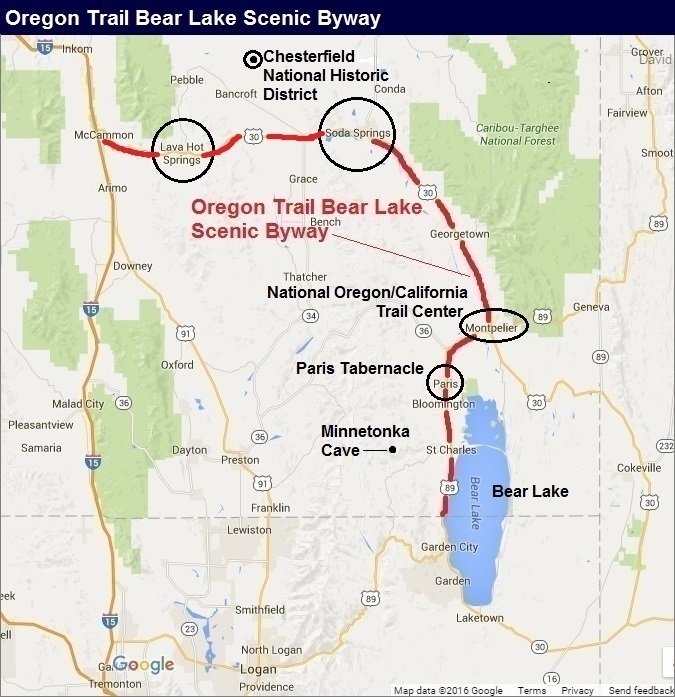 We will discuss each of these major attractions in the following paragraphs... And by the way, there are 13 sites around the Soda Springs Area that are identified as official Oregon-California Trail sites! Lava Hot Springs has world famous water that people love to soak in! Located 36 miles from Pocatello Idaho via Interstate 15 and then U.S. 30, Lava Hot Springs is a small town that has some of the most famous hot springs in the nation. Located along the Oregon Trail Bear Lake Scenic Byway, these natural underground springs bubble out over 2.5 million gallons each day which then pours into the Portneuf River. This massive movement of water keeps the hot springs water crystal clear and clean, and even though it's full of minerals, there is no sulfur... which means no bad smell! There are several hot spring business located in the town of Lava Hot Springs, and the temperatures of the pools range between 102 degrees (F) and 112 degrees (F). These world-class waters are a definite "must see and enjoy" during your time in the Pocatello Idaho area...that is if you and your family love fantastic natural hot springs water! Lava Hot Springs pool temperatures range from 102 degrees (F) to 112 (F). For hundreds of years people have gathered at Lava Hot Springs to rest, bathe and also to worship. Felt my many people that the Lava Hot Springs water are "healing waters", and is also felt by many that this ground is "neutral" and should be shared in peace by all who enters it. Once originally part of the Fort Hall Indian Reservation, in 1902 an Act by the State of Idaho granted these lands to be held by the State for public use. Eventually, the Lava Hot Springs Foundation, which is an agency within the Idaho Department of Parks and Recreation, took control of its operation, maintenance and improvement. The town of Lava Hot Springs also has a large pool with water slides. Visitors come from all over the country to enjoy the incredible water at Lava Hot Springs. Oregon Trail Bear Lake Scenic Byway in Idaho. local swimming pool hit an underground chamber about 315 feet below the surface of the earth. This chamber was filled with pressurized carbon dioxide gas and water, and when the man penetrated the chamber, this hot gas and water (84 degrees F) rushed to the surface at blasted into the air. And unlike the natural geysers that have a natural timer such as Old Faithful Geyser in Yellowstone Park, the Soda Springs "geyser" didn't quit erupting. Worried that it would soon exhaust itself and the water would stop flowing, the town of Soda Springs decided to "cap" the geyser, so as to regulate its eruptions. Timed on the hour, every hour, the Soda Springs Geyser erupts between 100 to 150 feet into the air on a calm day. However, if the winds are wrong, and the water actually hits the homes and businesses surrounding the geyser area, the Soda Springs Geyser is shut off completely until the winds calm down. There is a wind meter at the Soda Springs Geyser location that tells visitors if their timing is good or not-so-good. The Chesterfield National Historic District in Idaho was established in 1880. Located 25 miles northwest of Soda Springs Idaho along State Highway 34 on the Pioneer Historic Byway, Chesterfield Idaho was established in 1881 by Mormon pioneers after a railroad line was constructed through the town of Bancroft. Listed in the National Register of Historic Places and is a National Historic District, the town of Chesterfield thrived until agricultural challenges let to its desertion by the end of the 1930s. There are many buildings still standing in the historic ghost town of Chesterfield, and today the entire community is operated as an attraction for tourists... where guided tours are provided as well as a museum. Even though the town of Chesterfield was basically abandoned in the late 1930s, some families stayed, but by 1970 less than 20 people lived within the city limits of Chesterfield. The Chesterfield National Historic District is 2,160 acres in size, and contains 41 buildings and 8 sites. These sites and buildings include the LDS meeting house, which was built between 1887 and 1892 and is the best preserved building in Chesterfield. Other prominent buildings include a tithing house and amusement hall, as well as a fair number of historic homes located throughout the district. So if you like Western history, we highly recommend that you spend some time in the Chesterfield National Historic District, and hopefully you can even get set up on a fascinating tour of this amazing ghost town. Located 28 miles southeast of Soda Springs along the Oregon Trail Bear Lake Scenic Byway (U.S. Highway 30) is the National Oregon-California Trail Center in Montpelier Idaho that is dedicated to highlighting and interpreting the history of the 2,000 mile long Oregon Trail and California Trail. These trails were part of the largest voluntary migration of people in U.S. history. This fascinating world-class center is extremely well done and is an absolute "must see and explore" during your time along the Oregon Trail Bear Lake Scenic Byway. The National Oregon / California Trail Center is a world-class interpretive center. This entertaining interpretive center actually simulates an actual wagon train adventure along the Oregon Trail, featuring historically accurate live actors and interpretive areas. Visitors will go back in time to experience a ride in a covered wagon, visit a mercantile and gun shop, and sit around an evening fire in an encircled wagon train at the Clover Creek Encampment. The National Oregon-California Trail Center's simulated Wagon Trail Adventure is remarkable and is a "must do" for you and your family. Also found at the National Oregon-California Trail Center is the Rails and Trails Museum. This incredibly well-done museum preserves and wonderfully displays exhibits and artifacts demonstrating the history of the Bear Lake Valley. Being part of the National Oregon-California Trail Center, admission is free and contains three major collections: The Railroad Exhibit, the Daughters of Utah Pioneers Exhibit and the Bear Lake County Historical Society collection. The National Oregon-California Trail Center also offers an outstanding art gallery featuring The Simplot Art Collection of the Oregon Trail. Created by artist Gary Stone, this is a detailed portrayal of the Oregon Trail and California Trail experience. Gary Stone's inspiration is based upon actual emigrant diaries and emigrant journals that described the areas along the trails in precise detail. There are 44 acrylic paintings that tell the stories of these brave pioneers struggles, tragedies and victories... as they literally take the viewer back into this historic era. The National Oregon-California Trails Center also provides a themed dining adventure with 10 circled wagons as visitors enjoy an evening meal at sunset. Each table and seats are in a wagon where the scene is enhanced by large screen monitors reflecting scenes from the trail. Keep in mind that the Scenic Trails Chuckwagon is not an actual restaurant, and is mainly designed to host reservation-only group events. The National Oregon / California Trail Center is one of the highlights of the Oregon Trail Bear Lake Scenic Byway in Idaho. Along the Oregon Trail Bear Lake Scenic Byway you will drive through Paris.... Paris Idaho that is. And within this small Idaho town is a remarkable stone cathedral called the Paris Tabernacle. This historic structure was built between 1884 and 1889, and its Romanesque Revival style red sandstone tabernacle is quite breathtaking to see. If you'd like to go inside, there are guided tours provided as well. This impressive tabernacle was built by Mormon pioneers of the Bear Lake Valley, and was designed by Joseph Don Carlos Young, one of the sons of Brigham Young. These pioneers used ox teams and horsed to haul the heavy rock that was quarried nearly 18 miles away from the Indian Creek Canyon. The church sits approximately 2,000 people, and was placed onto the National Register of Historic Places in 1972. By the way, Paris Idaho also has other significant historic buildings, which include the Paris Hotel, the Bear Lake County Courthouse and the Pendry Drug. if you like old historic buildings check them out! Paris Tabernacle along the Oregon Trail Bear Lake Scenic Byway in Idaho. Located south of Montpelier Idaho off of U.S. Highway 89 along the Oregon Trail Bear Lake Scenic Byway, is Minnetonka Cave. This remarkable geological feature is one of the largest and most scenic limestone caves in Idaho. Minnetonka Cave is a wonderful nine-room cave that is home to fantastic stalagmites, stalactites and banded travertine that are truly worth taking the time to see. There are three stalagmites over 10 feet in height and over four feet in diameter. An incredibly enjoyable 90-minute tour takes visitors on a half mile walk through this amazingly scenic cave. Keep in mind there are 400 steps involved, and the cave averages 40 degrees all year long so bring a jacket. The Minnetonka Cave Road junction along U.S. Highway 89 is located south of the town of Bloomington and is very well marked. The Minnetonka Cave Road is paved, and takes visitors into the scenic St. Charles Canyon, where you will pass by some very nice campground facilities. Due to snow during the winter season, Minnetonka Cave is open from June through Labor Day... And by the way, Minnetonka is home to 5 different species of bats! Minnetonka Cave along the Oregon Trail Bear Lake Scenic Byway. Located about 119 miles south of Pocatello Idaho along U.S. 89 on the Oregon Trail Bear Lake Scenic Byway, Bear Lake is a natural fresh water lake that is a major attraction for water sport enthusiasts. Bear Lake has a very distinct turquoise color on a clear day, similar in color to lakes below alpine glaciers. Because of this bright turquoise coloring, Bear Lake has been called by many as the "Caribbean of the Rockies". Bear Lake is a mecca for anyone who loves water sports! are still remaining endemic species in Bear Lake including the Bear Lake strain of the Bonneville Cutthroat Trout, Bonneville whitefish and Bonneville cisco (and pink flamingos!). Marinas, Beaches and Tourist Towns! Bear Lake is a popular summer tourist destination, where these water sport enthusiasts can enjoy a good number of marinas, beaches and two wonderful tourist towns on the Utah section of the lake, which is Garden City and Laketown. Bear Lake State Park is located on the northern end of Bear Lake, just east of the small town of Saint Charles off U.S. Highway 89. There are 20 serviced campsites, 27 standard sites, 3 group shelters and 2 ADA campsites. There is a dump station, vault toilets, electricity, and boat ramps. There is also an informative Visitor Center that we recommend that you spend some time at to learn more about what this area has to offer. Note: There is also a Bear Lake State Park on the Utah section of Bear Lake, known as Bear Lake State Park East Beach.